New lightweight mahogany tele with maple top from USA Custom—finish by Starr Guitars. Pickups are Harmonic Design and Callaham hardware. I got this tele to play jazz on and am really digging it! It has the same neck size and shape as my "country" tele, just different body and neck woods, and of course, humbuckers. 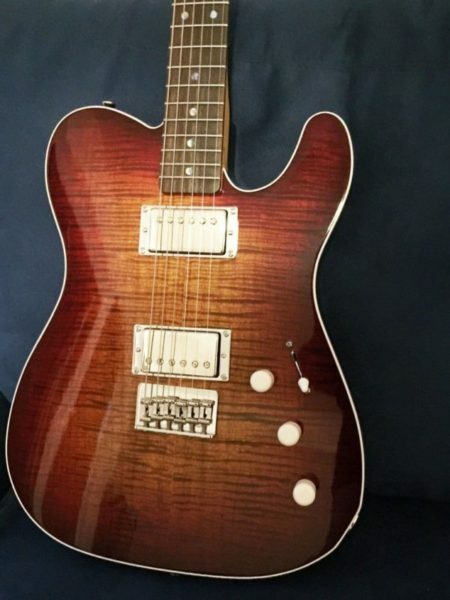 There's just something so inspiring about a new axe, and even though I've had good times playing jazz on the blue tele, the humbuckers really make a big difference. I has a coil tap that really just acts as a volume cut—not what I was expecting, but useful in and of itself. I really love the pickups, as they are not muddy despite the midrange content from the two coils.